Do you know how to make a Ceasar salad recipe? The first time I tasted one was between 1983 and 1985; immediately it became my favorite salad. Probably like many of you, I had no idea of the origination of this recipe. Also, like the majority of people, I was spelling it wrong; the correct spelling is “Caesar”. After I learned how to make my Ceasar salad recipe I read that it was the creation of Caesar Cardini, an Italian immigrant living in California and the name for the salad. The date of this salad goes back to the very early 1920’s. It is a surprise to me how something that good could be out there and it took so long for me to taste it; but I had more surprises. Supposedly, the salad was created after running out of most ingredients in his restaurant kitchen. When I learned how to make a Ceasar salad recipe, I also found out that the original did not include anchovies; that is another big surprise. I never did like anchovies, but I love the great flavor which minced anchovies add to this salad dressing. I cannot imagine eating this salad without the anchovies. I thought that was part of the traditional salad. Part of the original recipe did include eggs; coddled or what I call soft boiled. These eggs are cooked like one would hard boiled but only in about half the time leaving the yolk “runny”. This is not a big surprise to me because most recipes do include at least one raw egg however my favorite recipe has no eggs. Some Ceasar salad recipes might include other ingredients like garlic, avocado, mustard, tomato, seafood, chicken, cheese and bacon. As much as I love bacon, especially in salads, this is one that I choose it to be left out. As far as the other ingredients, my favorite recipe does include some of them which do add to the flavor. Here is the big shocker! 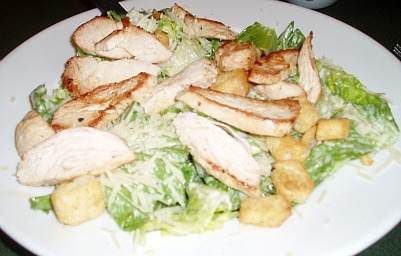 The original Caesar or Ceasar salad recipe was eaten with the fingers. Can you believe it! They were kind of like lettuce wraps. The eggs and oil were wrapped in the lettuce leaves and eaten like that. I am beginning to see what was meant by making due with sparse ingredients left in the kitchen. Well, that was creative but I think I prefer my versions of this great Ceasar salad recipe; now I am not misspelling my recipe. This recipe is enough base to make salad for a large crowd; reduce quantities for a smaller recipe. It is the best dressing I have eaten. In a large mixing bowl, blend together the mayonnaise, mustard, anchovy, lemon juice, minced garlic, Worcestershire sauce and the salt. Cover tightly and refrigerate for several hours. When ready to serve, for each serving clean 4 cups of romaine lettuce. In a large salad bowl put the 1 teaspoon olive oil, 1 teaspoon of lemon juice, 2 Tablespoons of the dressing mixture and ¼ cup of Parmesan cheese. Stir this together and add the lettuce. Toss until well covered and place in a small salad bowl to serve. Top with croutons. NOTE: You can adjust salad dressing, more or less as you like it. Many people think they cannot make a Ceasar salad without raw egg added. The following recipe has a raw egg in it but because of the raw egg it is not recommended to save any of this leftover Caesar salad dressing recipe. Put all ingredients in a blender and mix on medium speed. Pour over fresh crisp romaine lettuce and toss to coat. CREAMY GARLIC DRESSING FOR ROMAINE SALAD; Caesar salad recipe without the anchovies. Combine garlic and salt; mash into paste. Stir in lime juice; add egg and beat until foamy. Stir in mayonnaise and Worcestershire sauce. Pit, peel and dice avocado; tear lettuce into bite size pieces. In salad bowl combine lettuce, avocado, cheese, tomatoes, onions and croutons. Stir dressing to blend well and pour over salad. Toss lightly to coat and serve immediately. Combine and blend garlic, salt, pepper, thyme, oregano, lemon juice, mustard, steak sauce, Worcestershire, egg, anchovies, oil and vinegar. 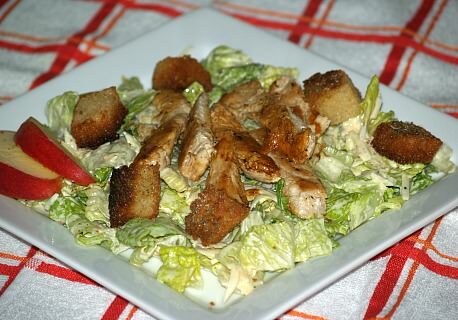 Pour dressing over Romaine greens and toss to coat; top with Parmesan cheese and croutons.